Staged auto accidents and other vehicular scams have been on the rise in the past ten years, especially in cities that have high instances of traffic congestion, like L.A., New York, D.C. and Detroit. The point of these scams is to deliberately cause an accident, forcing the other person or their insurance company to pay for vehicle damages and medical bills. If you’re already risking life and limb in an insurance scam, you want that scam to payoff as much as possible. It wouldn’t make sense to use a brand new Mercedes in order to get a few thousand dollars in insurance money so these fraudsters use an old, beat up vehicle that they can just junk when they’re done. Scammers will often use cars that are old, rusted and barely operable, but target cars that appear to be well insured, like latest model cars, luxury SUVs or even big rigs. 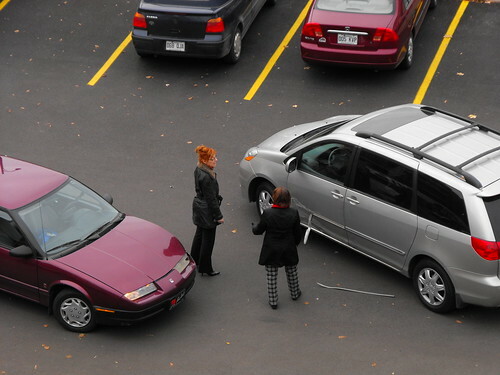 Smaller cars are also preferred, as they tend to show damage more dramatically than large ones. It’s important to understand that getting reimbursed for damage to a vehicle is not the goal of most of these scammers – the real money is in injury compensation. Most scammers will trump up their claims by complaining about soft tissues injuries, neck injuries and other hard-to-prove symptoms. Often they will complain about pain immediately after the accident – rubbing their neck, stumbling or even pretending to pass out. This will often get them a ride to the hospital on your insurance company’s dime, where they will continue the charade in hopes of a big insurance payout. In order to maximize one’s winnings, it would make sense to have as many passengers in the car as possible. Usually these passengers will be aware of the scam and will have been instructed beforehand what to say and how to act, though it’s not completely unheard of for scammers to use unsuspecting friends or strangers so that their legitimate reactions will make the accident appear less suspicious. Either way, a car full of people with indistinct injuries is a lot for your insurance company to investigate, and settling will often appear to be the best option. The Swoop and Squat – Two cars secretly working in tandem will create the illusion of an unavoidable accident. The swoop car will cut off the squat car, forcing them to slam on their brakes and likely be hit by the car behind them. The Panic Stop – Someone in the car ahead of you waits for you to appear distracted then slams on their brakes. It’s nearly impossible not to be at fault when striking another vehicle from behind, and injuries resulting from such accidents are often minor and easy to fake. The Drive Down – This scam is rare because it blatantly creates a “his word against mine” type of insurance scenario. It involves a scammer falsely waving you in front of them and then hitting you, denying that they ever waved you on in the first place. The Side Swipe – Perfect for low speed accidents in dual turning lanes, the side swipe involves the scammer car waiting until the last minute to turn their vehicle, then doing so suddenly when your car nears their lane. This is one of the hardest things to spot, and one of the main reasons why young people, women and the elderly are the most common victims of accident fraud. Just after an accident occurs, many scammers will act either overly aggressive toward the person who hit them or overly secretive about the circumstances of the accident and their private information. If the driver threatens you, demands compensation for the accident or immediately announce plans to take you to court, you should offer to call the police and have them investigate the crash. If the other driven seems reluctant to have this happen, it is likely that he or she has something to hide. Now that you know how some people deliberately try and involve innocent people in staged car accidents, always remember to keep your cool if you find yourself in a situation like this. Then, think of the points discussed above and prepare yourself to get out of any fraudulent accident scene. Scott Desind of www.thetrafficticketattorneys.com is an experienced attorney and has fought thousands of traffic tickets in California. He has helped clients in getting their traffic tickets dismissed or reduced to minimum fine. Next post: What searches are carried out when I buy a property?